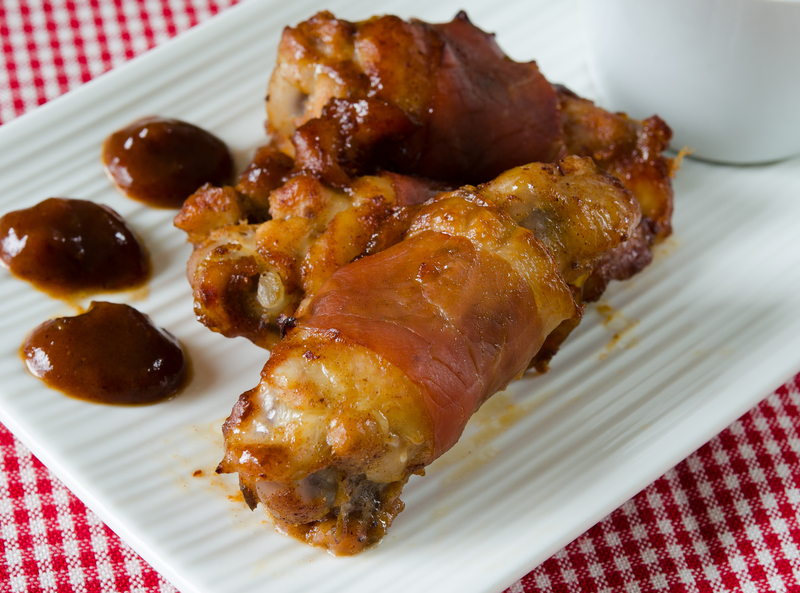 Pancetta-Wrapped Chicken Wings with Smokey Date Glaze. Summer is around the corner! Think picnics, deck parties, and barbeques! When I saw this recipe in Donna Hay Magazine’s Oct./Nov. 2014 issue, I was really stoked. Chicken wings are always a favourite for any of these events with my friends and family. I have made them two times now and I know they will become a staple for the summer months. 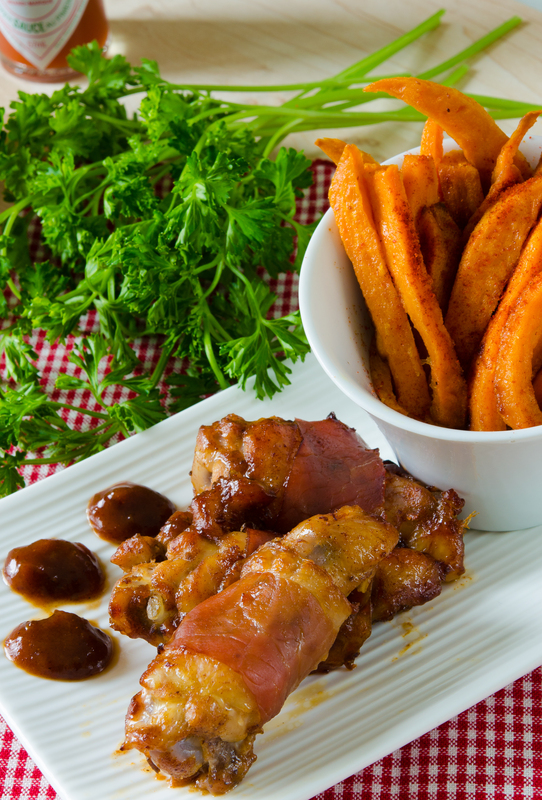 The rich, smokey flavour of the sauce and the salty tang of the pancetta will pair perfectly with your favourite summer cole slaw and fries; be they yam or potato. If you want to take your meal to the next level, serve your fries with the miso gravy that I posted on my last post. You will never go back to meat gravy, I assure you! I am bringing a humongous platter of my wings over to Angie’s Fiesta Friday! Please check out the most amazing virtual blog party on the world wide web! Come and join us, as we always love new contributors! Place the dates in a bowl and add the boiling water. Let stand for 5 minutes. Transfer to a medium saucepan over medium – high heat. Add the garlic, sugar, honey, ketchup, chili powder, paprika, oil, vinegar, salt and pepper and bring to a boil. Reduce heat to medium and cook for 6 – 8 minutes or until the mixture is slightly thickened and reduced. Remove from the heat and allow to cool for 5 minutes. Blend with a hand-held stick blender until the mixture is smooth. Place the chicken in a large bowl and add the date sauce. (Reserve 1/2 cup of the glaze to dip your wings in. )Toss well to coat. Cover and marinate, refrigerated for 30 minutes. Preheat oven to 425°F. Wrap each piece of chicken in pancetta and place on two large baking sheets lined with parchment paper. Roast for 30 minutes or until the wings are cooked and the pancetta is crisp. Serve with the reserved date sauce for dipping. Be sure to reserve some of the date glaze for dipping! The date glaze sounds amazing. I’m not one to often peruse Donna Hay’s Magazine, so I would never have stumbled upon such a tasty idea were it not for you. Bless your heart for sharing, and happy FF! Oh my gosh this sounds amazing! I just love dates and am always looking for a way to use them. It looks lovely! Great idea! Sweet and smoky – can’t beat that. Will be great backyard dining at my place this summer. Thanks. Oh yes, perfect for the backyard picnic! Thanks so much! Thanks Bonnie! Yes, I think I will use dates in more sauces now that I have tried this one! These chicken wings represent the apotheosis of the yummy food! AMAZING!! 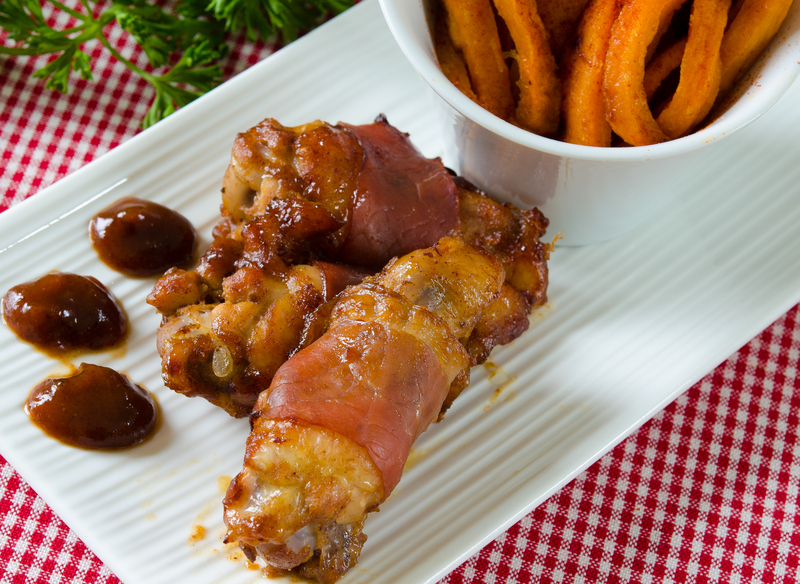 I have wrapped many a things in pancetta in my life, never thought to do chicken wings. Brilliant!!! sweet glaze+salty pancetta=truly indulgent treat! ps. love the wallpaper on your website!